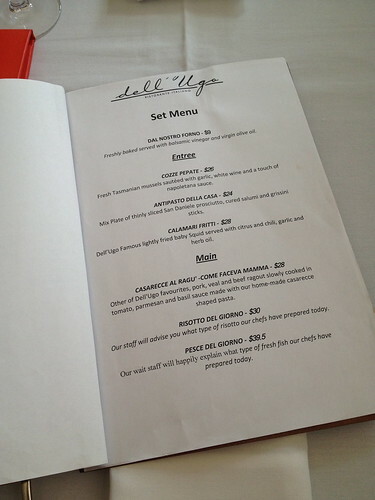 Back in October, SaC took me to New Farm for lunch at Dell'Ugo. He had bought a voucher for two people for two courses (entree and main each). We were early but patrons started to turn up soon after and most of them were taking advantage of the good deal too! Quickly, a set menu was given to us and we have three choices for the entree and mains. First up, we were served with freshly baked breads together with virgin olive oil and balsamic vinegar. They are certainly very generous with their condiments, however, at $9 for bread, was it worth it? For entree, I had my eye on their mussels and calamari over the antipasto. 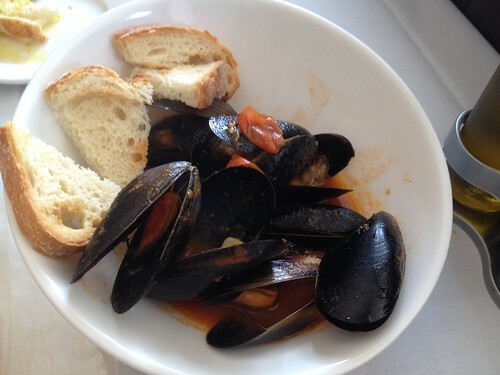 The mussels were fresh and cooked to perfection, with generous amounts to be shared among two of us. The flavour was all right and I think it can still be improved. Otherwise, quite a good meal. Their calamari fritti may be a better option over the mussels with its crunchy texture and not to forget, the lovely chilli, garlic and herb oil. 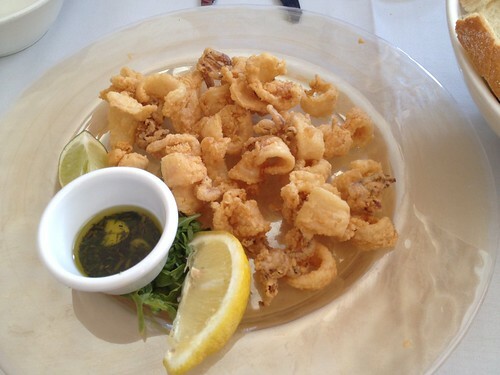 Somehow, I felt the calamari had been sliced quite thinly, unsure whether it's because they are from baby Squid or due to cost expenses? I chose the 'fish of the day' meal and it was salmon. 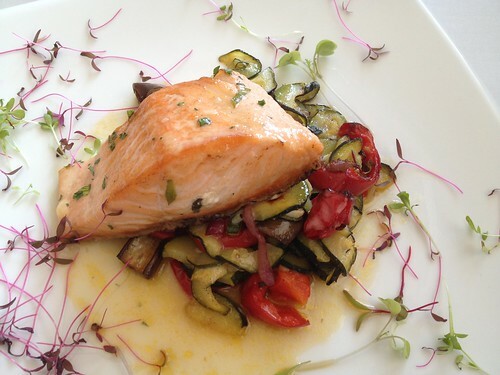 The salmon's portion was generous and cooked to perfection, not overly dry. It was served with a mix of vegetables of zucchini, eggplants and capsicum. Nothing very exciting here. On the other hand, SaC chose the scallop risotto instead. 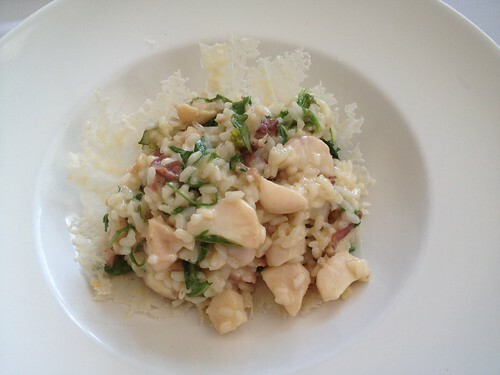 The arborio rice was cooked to perfection, quite creamy and flavourful with the bacon bits. I just think that the scallops may be overcooked in this meal. Love the parmesan cheese basket! The food here was not too bad, certainly a good deal with the voucher and we had good service.